翼の先にもするどいツメがついている。A sharp claw is also attached to the tip of the wing. Excellent scientific power, aiming to make the Earth a colony planet! 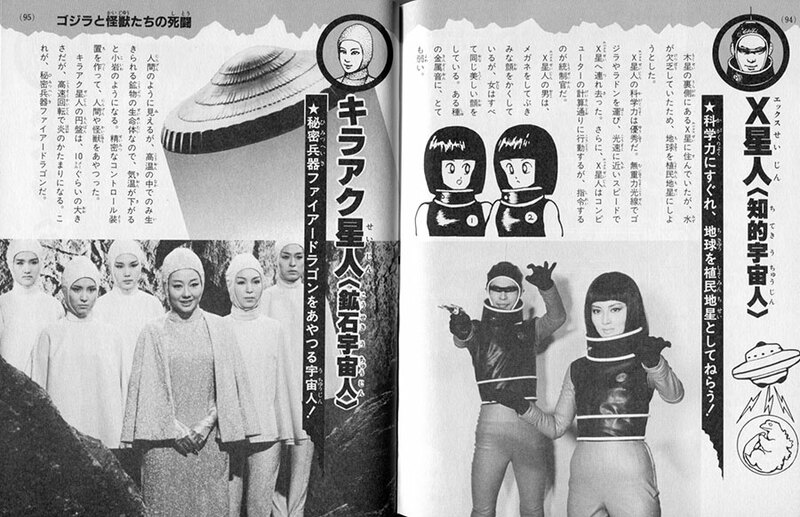 They live on the Planet X which is wooden on the backside. But because of the lack of water, they tried to make the earth a colony planet. The scientific power of Planet X people is excellent. They carried Godzilla and Radon with zero gravity rays and took them to the X stars at a very high speed. In addition, Planet X people behave according to the calculations of a computer, but the commander is the control. The Planet X men have huge eyeglasses and have eerie faces, but the women all have the same beautiful face. But they are very weak to certain metal sounds. The aliens controlling the secret weapon fire dragon! They looks like human beings, but they live in the body of minerals that can only live in high temperature, so when the temperature falls they looks like rocks. They made precise control equipment and they manipulate humans and monsters. The Kilaak flying saucer is about 10 meters in size, but it turns into flames of fire with high speed rotation. This is the secret weapon Figher Dragon. A deadly monster that gets bigger while gradually transforming! Body = height / 0.1 to 60 meters, body weight / 0.1 to 48,000 tons. Weapons = The whole body itself of the monster is a weapon, but even if touched, one would be poisoned. 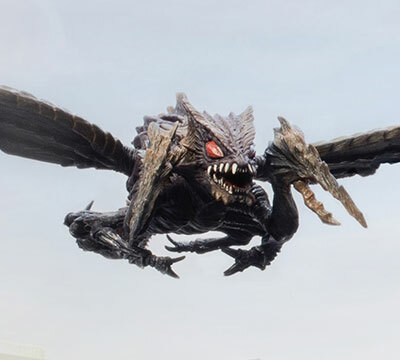 In addition, it emits sludge, flocculates poisonous gas while flying, and puts out a powerful laser beam from the eyes. Characteristics = Although I came on a meteorite from outer space, keeping sludge and toxic things as energy, it grew bigger and bigger. From a tadpoles it grew like a whale, and when it landed it stood with two legs and confronted Godzilla. After that, it could fly, and when it became adult it was larger than Godzilla. 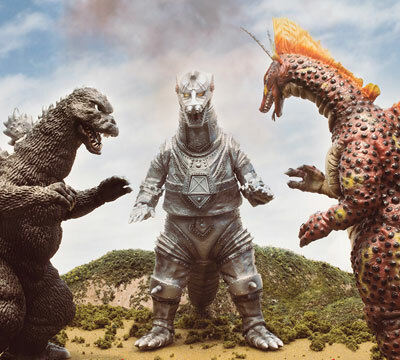 Battle history = Godzilla was its strongest opponent it fought one on one. 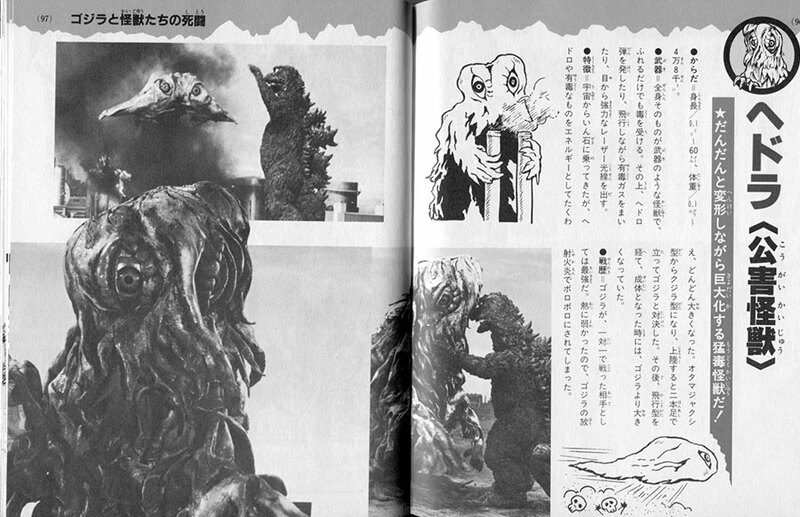 Because it was weak against heat, it was torn up with Godzilla’s radiation flame. ★改造された宇宙怪獣！ A reconstructed space monster! Body = height / 65 meters, weight / 25,000 tons. Weapons = A beam from the head, and cuts everything with the rotary cutter from its chest. Features = M Space Hunter Nebula is a remodeled space monster and moves as instructed. It flies at the speed of Mach 3, but when it fights for a long time the movement gets slower. 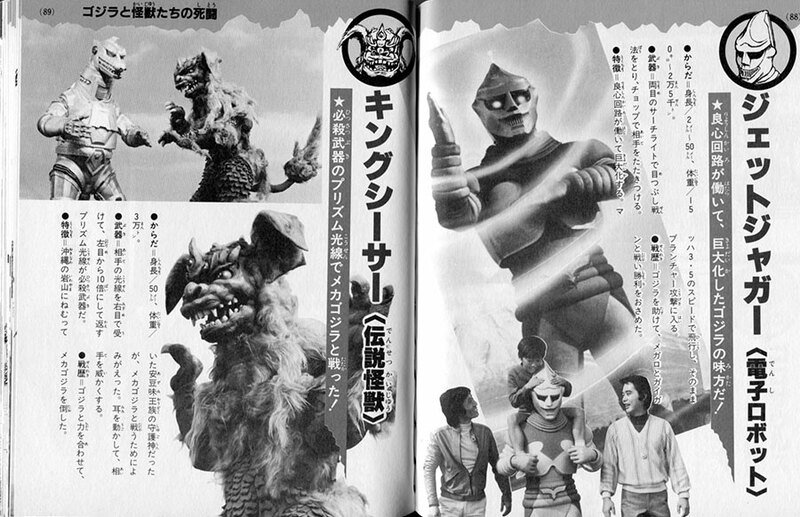 Battle history = Hunter Nebulae and the people of the kingdom of Seatopia came twice to Earth, but Godzilla, Angilas, and Jet Jaguar fought back. ★ゴジブリに似た生物！ Creatures similar to cockroaches! The Hunter Nebula had more advanced civilization than the present Earth, but the environment was contaminated and ruined. Among them, the Hunter Nebula people lived like lonely cockroaches. They turned into human beings, but their natural shape was revealed by reflection of light. Body = height / 55 meters, weight / 40 thousand tons. Weapons = Combining both hands in vibrating drill attacks, firing a laser from its horn, and fires napalm bullets from its mouth. Features = As guardian of Seatopia, the undersea kingdom, its moves are guided by a undersea man. By folding its wings, it flies at the speed of Mach 3. 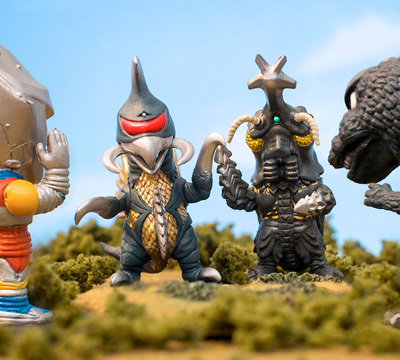 Battle history = It fought with Godzilla and Jet Jaguar in collaboration with Gigan, but it was beat down. ★海底深くに王国作る！ They built the kingdom deep in the ocean! It was another mankind who has made their kingdom deep in the ocean floor. They loved peace, but they were angered by the nuclear test of the earthlings and sent Megalon for revenge. 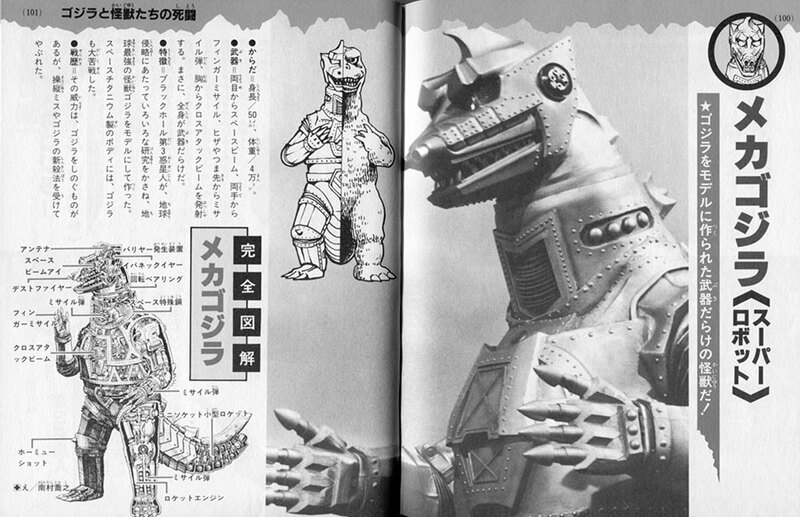 A monster full of weapons made with Godzilla as a model! Weapons = Space beams from both eyes, finger missiles from both hands, missile bullets from knees and toes, and cross attack beams from the chest. Indeed, the whole body is full of weapons. 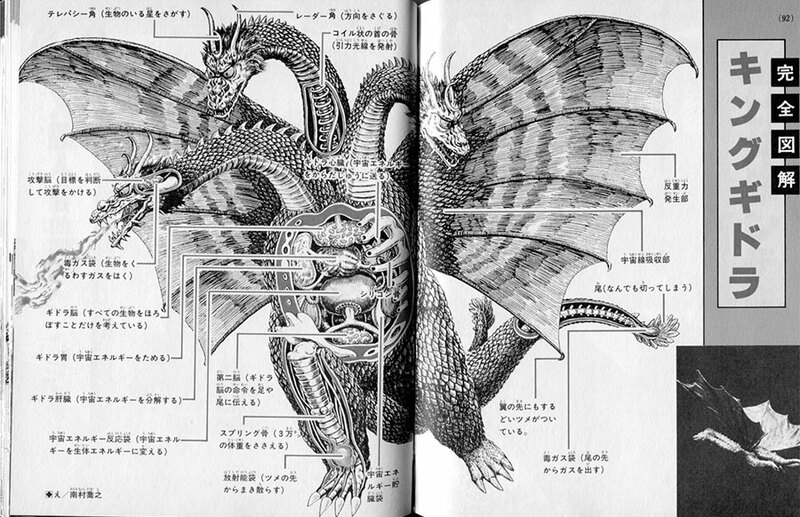 Characteristic = People from the Third Planet from the Black Hole made various studies for the invasion of the earth and made models based on the strongest monster Godzilla. Godzilla also fought very hard against its body made of space titanium. 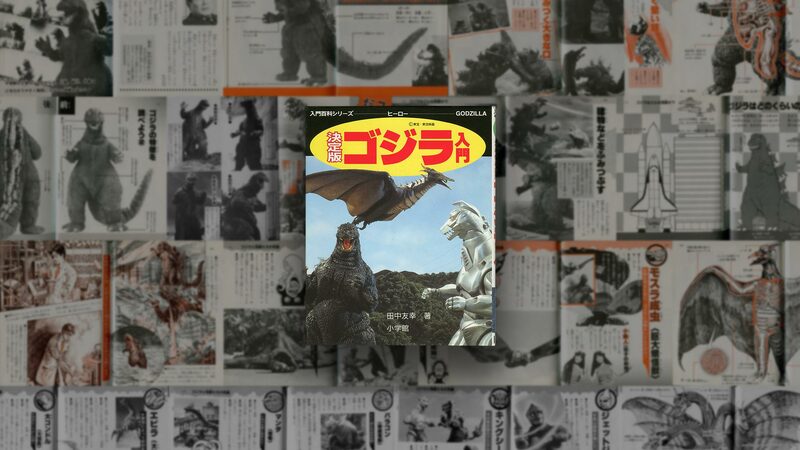 Battle history = Its power tried to outperforms Godzilla, but it was destroyed by a operating mistake and by a new killing method of Godzilla.